Notes: Nationally scarce (Na) in fens, bogs and dune slacks from Dorset to Cornwall, in the fens of East Anglia, in the west and north of Scotland and in the west of Ireland. 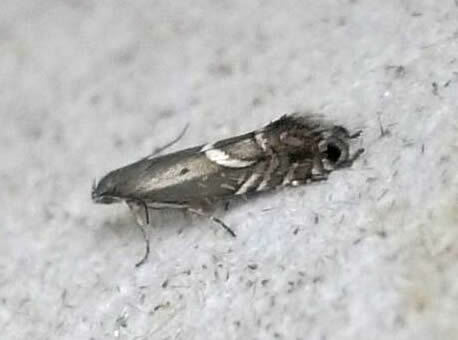 In Hampshire the foodplant occurs very locally in the New Forest, but the moth has yet to be found there. There is a single old record from the Isle of Wight. Wingspan 6-9 mm. Day-flying, often numerous amongst the foodplant. Very similar to Cocksfoot Moth G. simpliciella, but in G. schoenicolella the forewing is more evenly coloured, hardly tinged with copper in apical third; costal strigulae less evenly spaced, usually a larger gap between third and fourth from base: hindwing dorsal cilia whitish-tipped, becoming entirely white towards base (MBGBI Vol 2). Larva feeds within ears of Black Bog-rush, over-wintering in a cocoon.